Make your building look as good as new with affordable janitorial services from A & A Janitorial Services, a commercial and residential cleaning company in Huntington, West Virginia. 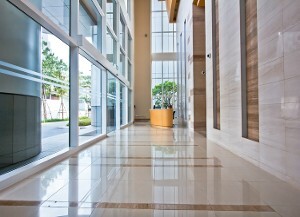 We offer everything from basic contracted cleaning packaged to customized floor care and construction cleanups. Contact us to receive more information about our cleaning services today. Draw attention to your beautiful tile or hardwood flooring with commercial and residentical cleaning floor care from A & A Janitorial Services. We scrub, strip, and wax floors, clean grouted tile, and vacuum out the soiled water before we leave. Our staff also polishes ceramic and tile flooring with a buffer machine, leaving your floor shiny and clean. In addition to hardwood flooring and tile care, we offer steam cleaning for carpet. Our uniformed technicians pre-treat, deodorize, steam, and Scotchgard™ your carpet. We use germicide in our carpet cleaning, but all cleaners are environmentally friendly and both kid and pet safe. There are no hidden costs in our cleaning services, and they are available as often as required. Make the view from your office more enjoyable with window cleaning from A & A Janitorial Services. We provide interior and exterior window cleaning on a weekly or monthly basis to remove blemishes of all kinds. When it comes to your construction cleanup projects, you can count on A & A for service that shines. Because at A & A , we approach your construction cleaning projects like we do every other cleaning project: with the client always in mind. 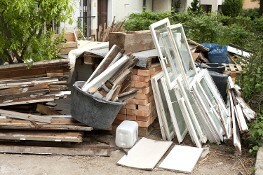 From construction debris removal to fine detailing, A & A always keeps your property - and your image - looking spotless. A & A offers this value-added service with the flexibility to work around your schedule. We work with you and your general contractor without ever inconveniencing tenants, customers or visitors. Preparing your new building space for use may sound like a simple task, but there is no one-size-fits-all solution to construction cleaning. Having the right tools, processes, and knowledge is essential to getting the job done right. More importantly, having a service provider with the expertise and experience in construction cleanup and with the resources to customize our construction cleaning program to meet your deadlines and special requirements, is an important business consideration that could end up saving you valuable time and money. That's where A&A comes in. As the hub of the home, the kitchen receives the most special treatment. We start by wiping clean all countertops and small appliances (toaster, coffee maker, etc.) then clean inside and outside of the microwave. Then, the stovetop, drip pans and under hood are cleaned as well as the appliances, cabinets, kitchen table and chairs. We'll finish by vacuuming and mopping. Additional rooms and services are available with a A & A residential cleaning service plan. Additional rooms and services are available with a A & A cleaning service plan. Call or email us to learn more about the services offered by our cleaning company today.